For most people, Gloria Grahame is a name they may never have heard of and yet in her day, she was a fully-fledged screen actress who won an Oscar. Now, through time, she has become almost forgotten, even though she starred in films like It’s A Wonderful Life and In A Lonely Place. However, her name will be remembered once more after Film Stars Don’t Die In Liverpool, a romantic drama based on the true story of how Grahame fell in love with a young Liverpudlian actor. In 1981, Gloria Grahame is in London for a play when she collapses. She calls her former lover, Peter Turner, a young actor, and asks if she can recoup in his family home in Liverpool. She tells them that she has gas but she seems much sicker than that. Peter then recalls the relationship that he had, meeting her in Primrose Hill during a session of cocktail drinking and disco dancing. This leads to a whirlwind romance, where the two unlikely lovers, she some thirty years older, skip from London to LA to New York to Liverpool. However, she holds a dark secret that could ruin her relationship until her call for help. Paul McGuigan’s film based on the memories of Peter Turner is a true crowd-pleaser. A film brimming with acting talent about an impossible romance which is funny and heartbreaking in equal measures. As a piece of cinema, McGuigan has some neat tricks up his sleeves, like having Peter open doors to worlds gone by, so one moment he’s in the bedroom where Grahame sleeps in 1981 only to step into a bedsit in Primrose Hill in 1979, where the couple first meet. This clever use of flashbacks never interrupts the flow of the story and as it moves along in a gentle manner, you start to understand how why this unlikely romance between a Hollywood legend and an unknown from Liverpool, would work. They genuinely cared for each other. You find yourself swept along by their love, as Peter is whisked off to meet her mother and her venomous sister, for Peter to introduce his family, who she adored so much she would rather stay with them than go to a hospital. All the while you get this feeling of doom and as the realisation of Grahame’s health becomes apparent, the tone of the film shifts to one of melodrama and sadness, as Gloria desperately tries to hide her issues to a confused Peter. McGuigan doesn’t play these scenes with subtlety. He wants the audience to react with tears and, from the screening I attended, he gets the desired effect. The film boasts an array of top performers, some in neat cameo roles, like Vanessa Redgrave and Francis Barber as mother and sister to Gloria, in a deliciously biting scene where they first meet Peter, to more fully rounded character roles from a funny Julie Walters as Peter’s mother, who is more concerned about having to spend 24-hours in Manila after visiting her brother in Australia, to Kenneth Cranham’s worldly-wise father and Stephen Graham as Peter’s feisty brother, with a very distracting curly wig. The true focus comes from Annette Bening as Gloria and Jamie Bell as Peter. Bening, who has been making impressive movie after impressive movie and yet no one really gets to see them, is given the opportunity to really get her teeth into a showy character and she does with aplomb. It might not be the most subtle of performances but you have to admire her gull to give it everything she has and more, capturing a woman in her twilight years who is given new vigour. Yet it is Jamie Bell who really steals the film in the best role he has had since Billy Elliott, playing a man who is utterly captivated by a Hollywood star and yet keeping his feet firmly on the ground. It is nicely underplayed until the final scenes, where he’s allowed some extra room that he certainly takes. 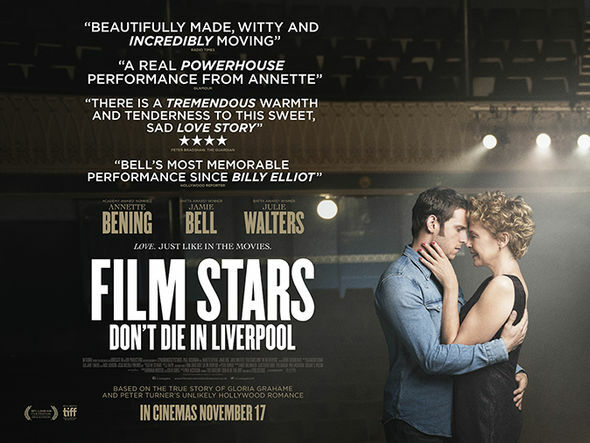 Film Stars Don’t Die In Liverpool is a romance for those who like falling in love. It does come across as sentimental by the end but the real interesting sections in the first half of the film work well. Go to enjoy watching actors allowed to act but take a tissue or two for the end. It will break your heart.